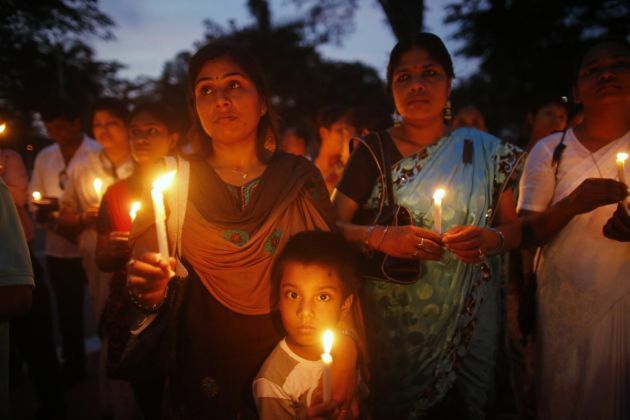 (Photo: REUTERS / Andrew Biraj)Members of the Bangladesh Christian Association attend a ceremony commemorating the victims of a bomb blast in Baniarchar, at the University of Dhaka campus in Dhaka June 3, 2014. People observed the 13th anniversary of the bomb blast, where a total of 10 people were killed and many others injured at a Catholic church at Baniarchar, Faridpur in 2001. Members of the Bangladesh Christian Association are demanding for the completion of investigation and trial for the culprits behind the bomb blast, local media reported. For Christians in a country like Bangladesh where they make up for less than one percent of the population proselytizers can upset the equilibrium of others of their faith in the Muslim majority country. This is the view of Jayonta Adhikari, a Bangladeshi member of the main governing body of the World Council of Churches, its central committee. "I feel that Christians in Bangladesh are living peacefully with other religious communities," said Adhikari in an interview with the WCC published on June 10. "However, if we want to protect the fabric of social and religious harmony in the country, promote our foundational values insuring protection of rights for all citizens regardless of their religious association, we must uphold secular values of the Bangladeshi constitution." He noted that Bangladeshi Christians are a small religious minority among the Muslim majority. "Yet, starting from the independence of the country in 1971, they have been engaged in numerous fields," said Adhikari. (Photo: WCC)Jayonta Adhikari, World Council of Churches Central Committee member, outside his office in Dhaka on June 5, 2014. "Many Christians have sacrificed their lives in the freedom struggles," he said referring to its conflict with Pakistan, which it was once a part of. 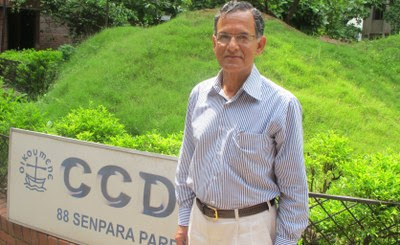 Adhikari, a Baptist, is director of the Christian Commission for Development in Bangladesh. Islam became the State religion in 1988 and Muslims make up 89 percent of the population of 166 million with Hindus making up more than nine percent. Christians form a tiny minority. Most of the churches belong to the evangelical family. Besides the National Council of Churches there is a National Christian Fellowship, affiliated with the World Evangelical Alliance. Since independence, said Adhikari footprints of the churches can be traced in the work for nation-building, education, humanitarian initiatives for climate disasters and development. "These are the contributions that should be recognized and evaluated by the State, as well as by ourselves." He said that Bangladeshi Christians, along with other religious minorities, are always affected by the regional and global geo-political situation. "The conflicts in neighbouring countries that involve religion often create a spill-over in our country. Many a time, occurrences in the West create a backlash on Christians here who are mistakenly associated with the West," noted Adhikari. It is bordered by India to its west, north and east; Myanmar (Burma) to its southeast and separated from Nepal and Bhutan by the Chicken's Neck corridor. "We live in a religiously plural society in Bangladesh. "At times it becomes a challenge for the churches to earn trust due to practices of some Evangelical churches who consider conversions a priority. "Such actions by these churches can be counterproductive in a situation like ours," said Adhikari. He said that through the National Council of Churches in Bangladesh and the United Forum of Christians, his group tries to speak about human rights issues however it can. It engages in issues related to women, young people, and underprivileged groups. "In order to make peace and justice a reality in Bangladesh, issues such as corruption, a radical Islamic mindset and manipulation of religion must be addressed by both the government and the people," said the Bangladeshi church leader. "We hope that they can do more to make sure that peaceful co-existence and economic growth continue in Bangladesh." Bangladesh is a developing nation and is a leading global exporter of textiles and garments, as well as fish, seafood and jute, but its workers often work under gruelling conditions with little pay say non-government activist groups. It also engages in shipbuilding and is known as the birthplace of microfinance.